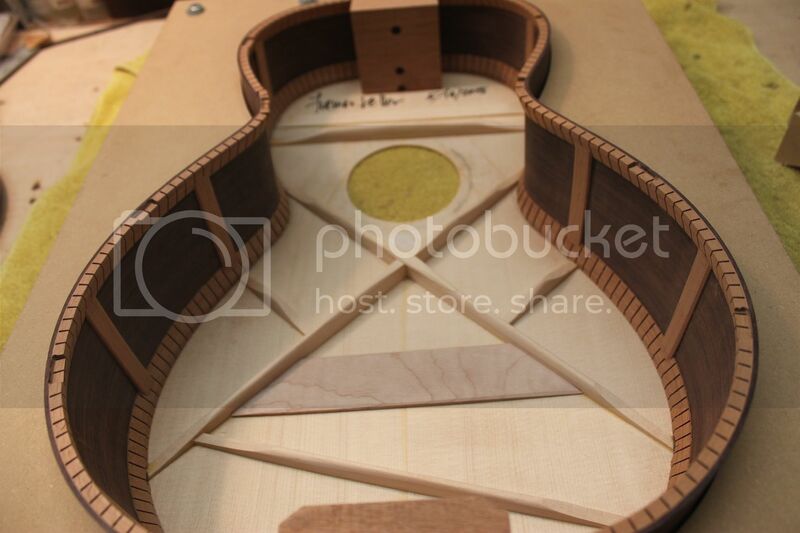 I am starting a pair and have installed sound hole ring and made one x brace. Other is redwood, now 1/8+" This seem too thick. I read up on bracing and decided to go with 1/4x1/2" which seemed popular choice. Now that I look at it on both boards it seem out of proportion. Just too light. Is this going to work as is? Bob, I have built three guitars from the Antes small concert plans. I used sitka for one and Lutz for the others at about 0.095 thickness. The general feeling at another builders forum was that his 5/16 unscalloped braces are "over braced" - I made mine 1/4 x 1/2 and thinned the profile quite a bit. 2/32 seems way too thin for a top, 1/8 seems too thick but I've never worked with redwood. FWIW one of mine was played at the Steel String Listening session at the last GAL convention, I had someone come up to me later and comment on the projection. I asked where they were sitting, they said the back of the hall. Sorry, Typo on Spruce top, its now 3/32". I saw your picture and other comments seem to concur, but having made it I don't see this pulling the top into any dome. With the OM models the dome was there, but not much. Now I don't expect it. I guess that's not its main purpose. But the redwood top... 1/8" seem to be the consensus. The top is beautiful and free from a friends attic.3 of them from an old 5 ft board, perfectly quarter sawn. It rings like glass. We are only talking about 2-3 64ths, but at this scale it is noticeable. I have never built a micrometer and am still using a caliper. But I am developing a feel for the woods at these thicknesses and the redwood must be a little thicker. I think you'll be fine with those dimensions. The redwood does need to be a bit thicker. Sorry that I missed the last convention! At the previous two, I was the musician who got to play for the listening session, and I missed doing it again last time. Mark Swanson wrote: I think you'll be fine with those dimensions. The redwood does need to be a bit thicker. I've been attending since 2008 and have enjoyed both you and Mark Hansen playing for the Steel String session. What an incredible experience for the audience to sit and hear 30 or 40 hand built guitars, then have the builders explain what they were doing when they built it. Must be pretty hard duty for the player, eh? It was an honor and a great time! It was mind-blowing to play all those guitars.